Syria's Director-General of Antiquates and Museums, Dr. Maamoun |Abdul-Karim, as well as other officials including the Ministers of Culture, Information and Tourism often speak of their beloved country being "an open-air museum." Few would challenge their characterization as the global community focuses increasingly on how to stop crimes against culture which are now widely viewed as crimes against the common heritage of humanity. Identifying and stopping the current spread of looting and shadowy illegal antiquities marketplaces requires their exposure to sunshine. One is reminded of some wise counsel from U.S. Supreme Court Justice Louis Brandeis back in 1913: "Sunlight is said to be the best of disinfectants. If the broad light of day could be let in upon men's actions, it would purify them as the sun disinfects." Toward this end, the UN Security Council and particularly Turkey, need to cooperate much more with Syria to halt the trade in looted antiquities that helps fund jihadist groups. 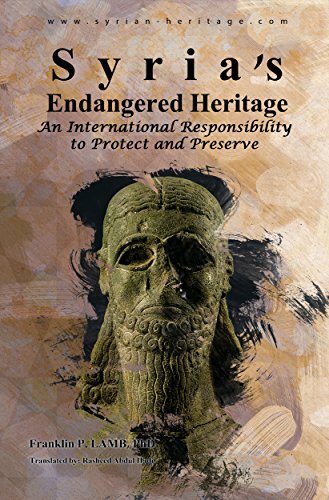 To its credit, on 2/12/2015, the Security Council passed a resolution identifying groups such as ISIS and Al Nusra Front of generating income by selling antiquities looted in the conflict and the UNSC is well aware that Turkey has been facilitating smuggling of cultural heritage treasures across it (560-mile) border. Turkey has become the main route for looted Syrian antiquities, followed by Iraq, Lebanon and Jordan. A BBC Radio 4 report of 2/17/2015 quoted a 'middle man' who sells looted Syrian artifacts to international dealers: "From Turkey the final destination is Western Europe, he says. "Turkish merchants sell it to dealers in Europe. They call them, send pictures... people from Europe come to check the goods and take them away."